A 1582 view of Verona. This year marks the 400th anniversary of William Shakespeare’s death. Two shows at the Boston Public Library observe the occasion. “Shakespeare’s Here and Everywhere” runs through Feb. 26 at the Leventhal Map Center at the BPL. “Shakespeare Unauthorized” runs through March 31 in the library’s McKim Exhibition Hall. The maps show happily reminds us of an often-overlooked aspect of Shakespeare’s work. He’s most commonly associated with the enduring characters he created: Hamlet, Macbeth, Othello, Juliet, Cleopatra, Julius Caesar. To the extent we think of Shakespeare geographically, it’s in terms of England — or, as enumerated by John of Gaunt, in “Richard II”: “This blessed plot, this earth, this realm, this England” (one guess how he would have voted on Brexit). Yet each of those characters is inextricably associated with a a no-less-enduring — and not-English — place: Denmark, Scotland, Cyprus, Verona, Egypt, Rome. Some Shakespeare plays even have places in their title, “The Merry Wives of Windsor” (all right, that’s English), “The Merchant of Venice,” “Timon of Athens.” Athens and environs also provide the setting for “A Midsummer Night’s Dream.” The Bard got around. Lest we forget, the theater where his plays were staged was named the Globe. Coleridge famously referred to “myriad-minded Shakespeare.” He could as justly have called him map-minded Shakespeare — even if, in “The Winter’s Tale,” he did, ahem, refer to “the coast of Bohemia.” Truly, he is our supreme geographer of the imagination. Shakespeare’s life coincided with the Age of Discovery and its explosion of geographical knowledge. “O brave new world,” Miranda declares in “The Tempest.” She could have been speaking for all of Western Europe. A few years after Shakespeare’s birth, Abraham Ortelius published what is now considered the first modern world atlas, “Theatrum Orbis Terrarum” (1570). It’s on display here — and a massive, majestic thing it is — along with other vintage maps. 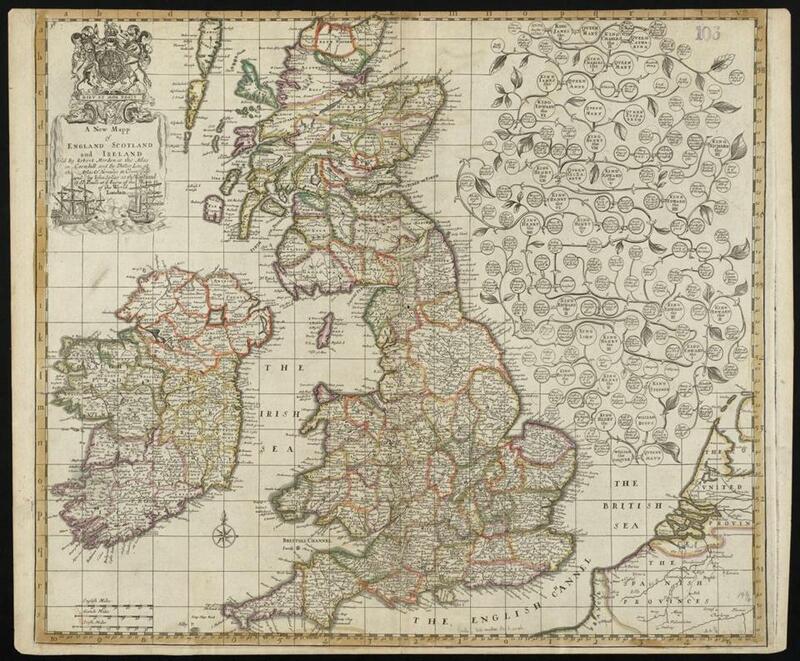 Robert Morden’s 1687 view of England, Scotland, and Ireland. The 16th century predominates, but Bernard Sleigh’s “Anciente Mappe of Fairyland Newly Discovered and Set Forth” is as recent as 1917. Some of the maps bear a general relation to Shakespeare, such as Robert Morden’s 1687 view of England, Scotland, and Ireland. 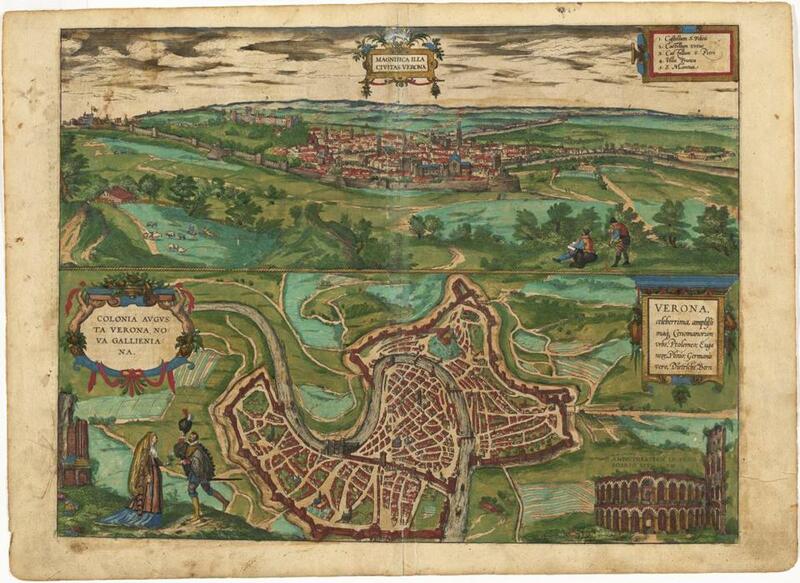 Others are more specific: a 1629 map of Denmark, a 1582 view of Verona. Visually splendid, the maps convey a sense of wonder that reproaches our own GPS-narrowed perspective. More than that, they underscore the miracle of Shakespeare being able to take a specific location and render it universal. Anyone who knows “As You Like It” has been to a Forest of Arden far more real than the one in England. “Shakespeare Unauthorized” draws on the BPL’s holdings, with almost all the items from its Thomas Pennant Barton Shakespeare Collection. 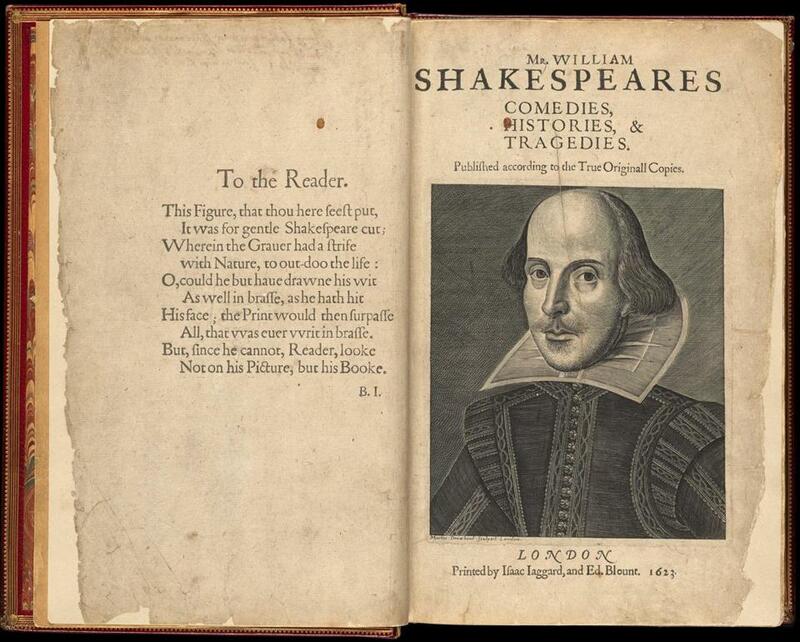 Its 15,000 volumes form one of the largest Shakespeare holdings of any public institution. The library purchased the collection in 1873 for $34,000. That was half the appraised value then. In constant dollars it would be $646,000. An excellent deal at the time, it looks even better now. There are sections on stagecraft, conspiracies (the longstanding speculation over who “really” wrote the works of Shakespeare), music, poetry, publication history, playwriting contemporaries (Ben Jonson, Christopher Marlowe, etc.). We see a facsimile of Shakespeare’s will — Will’s will, as it were. The show concludes with a coup de theatre: a display case containing one First Folio (the first authoritative gathering of the plays), one Second Folio, two Thirds, and a Fourth. Digital displays allow visitors to call up any page to compare and contrast and, of course, savor. The volumes are mighty objects, impressive in scale, and all the more impressive seen in such an array, if nowhere near as impressive as what’s inside them.